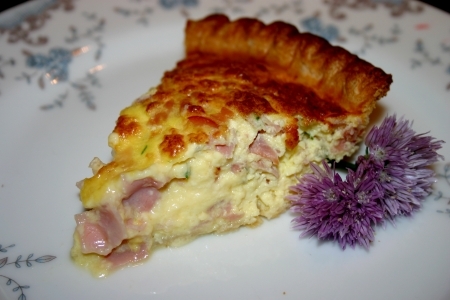 Quiche is wonderful for any meal, but the addition of chive blossoms will leave your family or guests “chatting” about it all day or the next day! The flavor of the blossom will remind you of a bit of garlic, onion, radish and of course a chive flavor. Chives are a hardy plant that comes back every year and will get bigger each year. Around the middle of May, the chive plant grows blossoms that are a beautiful purple color. This dish was quickly created with a premade pie crust and by adding everything to the mixer, except the ham. Give it a quick stir to add the ham and into the oven. An hour later we have a dish worth chatting about! Place and mold pie crust into a deep pie dish about 2 – 3 inches deep. Don’t precook. If using a deeper pie dish, extra eggs and cream may be needed. In a large bowl using a mixer, mix eggs until fluffy. Add half and half, cheese, chive blossoms and salt and mix until combined. Using a spoon, stir in the ham. Pour mixture into the pie crust and bake in a preheated oven at 375 degrees for about 30 minutes or when a knife is inserted it comes out clean. Allow to cool for about 15 minutes before serving. Garnish with chive blossoms to create a dish worth chatting about! Keep extra pie crusts, puff pastry sheets or puff pastry shells in your freezer for quick breakfasts, appetizers, meals or desserts. You never know who will drop by unexpected and this is an easy way to whip up something!